The 10 Best Educational Activities for Children in Alabama! When the kids aren’t in school, it’s important to keep their brains stimulated. In Alabama, there’s a diversity of exciting educational activities that will not only expand your child’s knowledge, but inspire them. From interactive museums, to space centers, to art exhibits, here are the 10 best educational activities for children in the state. There’s no better place in Tuscaloosa County to ignite your child’s curiosity and creativity than the Children’s Hands-On Museum. Spend the day exploring three floors of hands-on exhibits that everyone can enjoy. Is there a mini-daredevil in your family? Take them to the Southern Museum of Flight where they can learn and interact with some of Alabama’s most historic and brave piloting history. And, for the future Elon Musks in your family, the museum offers summer camps sponsored by Auburn University’s Center for Robotics Education. For a fun educational experience that truly takes you back in time, the Alabama Constitution Village brings visitors into the simpler time of the early 1800. Learn and engage with professional actors in period dress who will educate you on what making clothing, baking, and living was like in the early 19th century. Aside from their healthy list of animals to learn about and view, the Birmingham Zoo always has something going on in the summer. 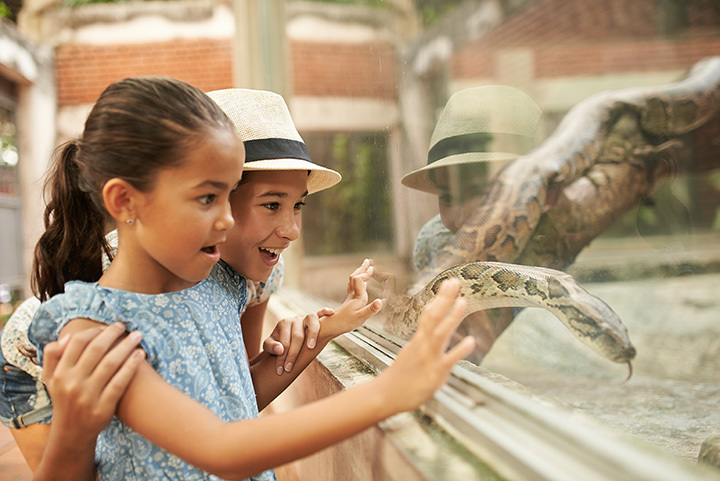 Your children can see animals ranging from elephants, to lions, to anacondas, to black bears. There’s also a wealth of events and educational programs the only family can enjoy. If you have an aspiring Amelia Earhart in your family, the Tuskegee Airmen National Historic Site is the place to visit. Learn about the daring Tuskegee Airmen, the first African American military pilots. It is an adventurous story you’ll never forget. Follow in the footsteps of Sally Ride and Neil Armstrong, and take your kids to the U.S. Space & Rocket Center. The high-energy setting is perfect for the littler adventurer in your life. The center offers day camps throughout the summer where kids can learn how what its life to be an astronaut. Is football a tradition in your family? Pass on your passion to your kids by taking them to the Bear Bryant Museum. You don’t need to be a fan of the Crimson Tide to enjoy this site. The museum tells the full history of football in Alabama, and how the state came to dominate college football. For the young history buff in your family, check out the kid friendly Birmingham Civil Rights Institute and introduce our young ones to a crucial time in American History. The museum lies across the street from historic Kelly Ingram Park that is open to the public to reflect on the significance of the Civil Rights Movement. If you have an aspiring Monet or Van Gogh in your family, take them to the Huntsville Museum of Art. Aside from the priceless works of art, the museum frequently offer classes for kids of all age groups. Do you have kids that love to play dress-up? The Mobile Carnival Museum is a lively and colorful museum the whole family can enjoy, and it exhibits some of the most elegant and wacky costumes carnival has ever seen. Learn about the history of Mardi Gras in the South and see some of the most creative and artistic floats that kids of all ages will love.